Team building: All for One and One for All! So, you're thinking of a group event that would be out of the ordinary? Why not invite your colleagues or friends for an afternoon of swordplay? A lesson in the most glamorous Olympic sport followed by thirst quenching Champagne have a fascinating effect on group dynamics! Fencing teaches you how to cope under pressure, it develops anticipation, timing and concentration - qualities crucial for any company or business. Also, it's great fun, good exercise and the most memorable experience which will stay with your team for years to come. If you're planning a groom-to-be stag do, our fencing session will again provide the perfect starting point for the London stag weekend of a life time. Get your mates to compete in courtesy and style, calculate their moves and thrusts with precision, swash and buckle sending sparks with their blades! 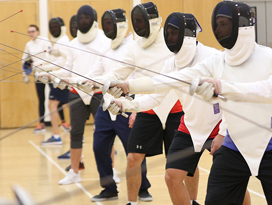 The fencing session can also be part of a unique and fun hen party, mixing fitness, romance and chivalry. After you leave our fencing club, London's best bars and restaurants are barely a lunge away! A fascinating brief history of fencing with demonstration of original weapons. Fencing footwork including stretching exercises and games - great for group dynamics and loosening everyone up! Bladework: thrusts and cuts, parries and deceives. The Main Event: The Tournament! Either an individual or a team event with the Grand Final! All this will take around 3 hours including a short break. Your fencing event will be led by our world-class Fencing Masters. All fencing equipment will be provided. The session can be arranged either during week days or on an a Saturday afternoon. The group can be anything between 6 and 35 people. Prices start from £12 per hour per person! Please fill the short form below with details of your request to make the next step. En guarde!